SOUL'D has performed at the Byron Bay Blues & Roots Festival, The Beach Hotel, The Railway Friendly Bar, The Brunswick Heads Hotel, Byron Bay Community Center, The Buddha Bar, plus many more local wedding reception venues. The band features ten musicians, who just love recreating the Retro sound of the Golden Area of Big Band Music from Soul to Funk to Swing and more. Music to get you moving on the dance floor. The band features a five piece horn section, female and male vocalists and cooking rhythm section. 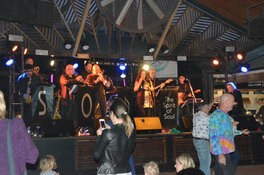 Based in Byron Bay SOUL'D performs regularly at all Gold Coast Venues and is a popular wedding band, corporate functions and private party band. SOUL'D performs the classics from the Legendary Soul, Motown, Funk and RnB Artists heard on the Atlantic, Stax, Motown and Savoy Labels of the late 50s,60s,70s including James Brown, Aretha Franklin, The Supremes, Marvin Gaye, Sam & Dave, Smokey Robinson and the Miracles, Temptations, Martha Reeves & the Vandellas, Stevie Wonder, The Contours, Junior Walker and the All-Stars, The Four Tops, Booker T & The MGs, Wilson Pickett, Eddie Floyd, Otis Redding, The Mar-Keys, Sam Cooke, Jackie Wilson, Earth Wind & Fire & many more. Soul’d also plays selections from Joe Cocker, Chicago, Blood Sweat & Tears, The Blues Brothers and The Commitments.